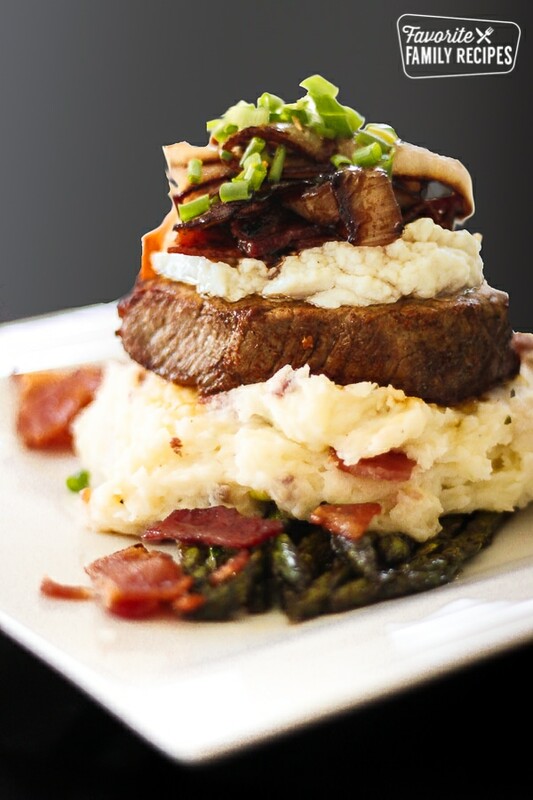 This Fancy Schmancy Filet Mignon is a winner for Valentine’ Day, Anniversaries, and Birthdays. Looks super fancy but really it’s not that difficult to make! Ok, you asked for it! Here is the “Fancy Schmancy Filet Mignon” recipe I put on Facebook. I am putting the basic filet recipe on here as well as instructions on how to make it a full meal (as shown in the picture above). My favorite dessert to have with this meal is individual Melting Cakes. I like doing them because they are an easy, yet fancy looking dessert to pair with this dish. It looks fancy, yet it is hardly any work at all. I made this for my husband on Father’s Day and he has been BEGGING me to make it since. Everything about it is so good– and really, it isn’t THAT hard. I highly suggest cooking your filet to AT MOST medium. I prefer my filet medium-rare because it practically melts in your mouth– but that is just me. Medium will be great too.. any more than medium I can’t guarantee you will have a juicy filet! Just sayin’. 🙂 Enjoy! I would love to see your pictures of YOUR Fancy Schmancy meal! Send them to [email protected] or put them on FB or twitter as #fancyschmancydinner ! **Oh and one more little tip… get your filets from the butcher counter! They will be bigger and better and your butcher can help you pick the best cut! Grill over medium heat to desired doneness (again, PLEASE do not over cook, it will taste best with a pink center-- medium rare is what I like best). Remove from heat and allow filets to sit about 2-3 minutes to let the juices settle into the filet. Mix together balsamic vinegar and brown sugar. Bring to a slight boil over medium heat, stirring constantly until sugar is dissolved, reduce heat to LOW and simmer for about 15-20 minutes until it has reduced to a syrupy consistency and half of the original volume. While the glaze is simmering, saute mushrooms and onions in butter until onions become soft and transparent. Remove from heat. Layer sauteed onions/mushrooms over filet and drizzle with balsamic reduction and top with green onion. If you want to do all the optional additions to make it a full meal, layer in this order: asparagus, loaded potatoes, filet, blue cheese, mushrooms/onions, and top with green onion. Looks incredibly good! I’m not big on bleu cheese anything. Can you suggest something you would replace that with? Thank you. Your recipes are fast becoming our family favorites. This was fantastic! We’re not blue cheese fans but I tried it anyway (not telling anyone what the sauce was) and we all like it. From the rub to the sauces- everything. Thanks for sharing the recipes! First I have to say that I’ve made a few of your recipes and loved them all but HAD to comment on this one. Made it for a belated Valentine’s Day and it was SO good. I wish I could post a photo here but I’ll definitely tweet it to you! I can’t wait to make this again – well worth the time and effort!!! Please tweet it to me! I would love to see the pictures! I am so happy to hear you liked it 🙂 like I said… my husband is always BEGGING for me to make it! lol we actually had it tonight! How do you cook the asparagus? Hi Laura, Here are a couple of easy ways to cook asparagus. Thanks for asking! Hello, how many plate dies this recipe make? I’m about to make it for 8 adults and 7 kids and don’t know how much meat to buy! Hi, I’m vegetarian, married to a steak lover who has strong aversion to my using his grill and steaks cooked any other way than with flame, so in the 25 years we’ve been together I have only cooked him steak once inside (he loved it) I’d love to make this, it looks awesome, but I am struggling with the directions on this…Let’s suggest I’m going to sear mine on the stove then transfer to the oven for a bit then let cool…when should I start my balsamic mix? (I have a balsamic glaze I could use, too I guess) But the 20 minutes you say to let the mix simmer is after the recipe says your steak is done cooking, so I just had to check 🙂 Thank you! I am not able to view or purchase the dry rub. Can you please tell me what ingredients are needed to make it?